Here at Elite Smiles Chastain, we’re proud to be your premier choice when you’re looking for a pediatric dentist in Atlanta and Chastain Park. What makes us such a great option in and around these communities is that you won’t only have access to a highly trained and educated pediatric dentist, but we’re also home to a family orthodontist as well. We’re capable of taking care of just about any oral needs for your child without you having to visit multiple practices to get them fulfilled. You’ll find a plethora of helpful services at our office, from regular dental check-ups to braces. As well as giving you some helpful advice and guidance while your child is teething. Teething is the process where a child’s primary (baby) teeth emerge through his or her gums and become visible. This typically occurs somewhere between six and nine months of age, though in many cases it can happen a few months earlier or later. The front teeth are usually the first to emerge and by the age of three, all 20 teeth should have erupted. These signs will likely show up somewhere around four days before the tooth breaks through the gums and will last until about three days after the tooth appears. Just be sure not to freeze the teething ring or pacifier as it can burn if left in your baby’s mouth for too long. Over-the-counter medication can be helpful, but make sure that you check with your pediatrician or pharmacist to make sure that you have the correct dosage. Also, please avoid rubbing them on the gums because they can burn. Finally, numbing agents shouldn’t be used on babies under the age of two unless you’re directed to do so by a physician. Contact Your Atlanta and Chastain Park Pediatric Dentist and Family Orthodontist! 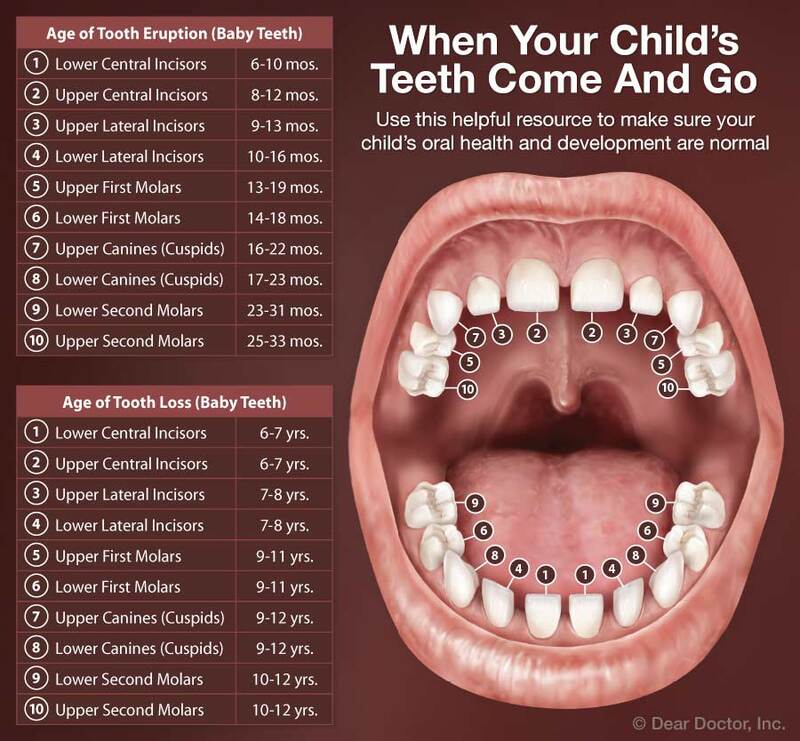 If you have any questions or concerns about teething, feel free to contact us and let us know. If you’d like to schedule an appointment with your pediatric dentist in Atlanta and Chastain Park, we encourage you to fill out our appointment request form. We’re looking forward to hearing from you and helping your child through the teething process!